Author(s): Chacour (Elias) and Jensen (Mary E.). 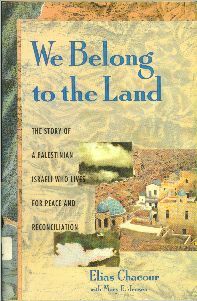 Subject(s): Biography, Chacour (Elias) - 1939, Israel - Galilee, and Palestinian Arabs - Israel - Galilee - Biography. Nominated several times for the Noble Peace Prize, world-renowned Palestinian priest, Elias Chacour, narrates the gripping story of his life spent working to achieve peace and reconciliation among Israeli Jews, Christians, and Muslims. From the destruction of his boyhood village and his work as a priest in Galilee to his efforts to build schools, libraries, and summer camps for children of all religions, this peacemaker’s moving story brings hope to one of the most complex struggles of our time.